A large humpback whale, seen stuck at the Ventura Harbor Marina, made its way out, officials said Sunday, May 21, 2017. 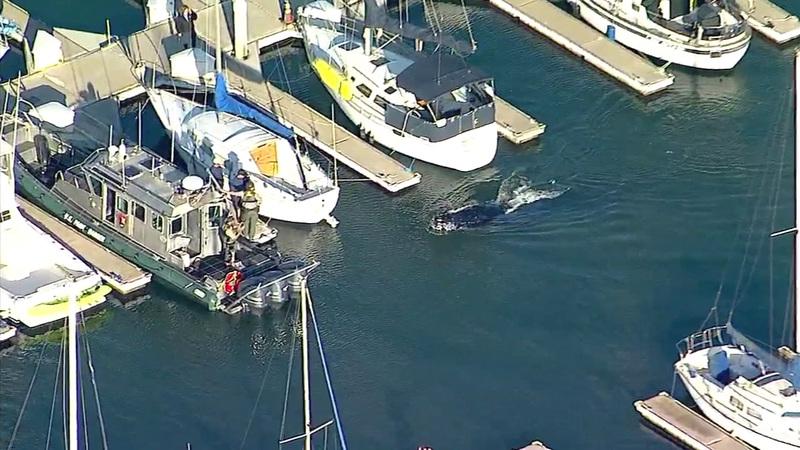 VENTURA, Calif. -- A rescue operation was terminated Sunday morning for a large humpback whale that got stuck in the Ventura Harbor Marina in California. According to the Ventura Harbor Patrol, the wayward humpback whale found its way out into the ocean overnight after it got trapped in the finger of the M dock at Ventura Isle Marina and Ventura West Marina on Saturday. At times, the 35-foot long whale appeared agitated as swirls of sand and dirt muddied the waters at the end of the dock. The whale hit the dock a few times and crashed into the back of a boat, nearly hitting a propeller. The mammal breached the water several times and swam around the docks as large crowds of people gathered in the parking lot area above. Wildlife experts spent four hours trying to encourage it out. They used a hydrophone that plays underwater whale sounds and blocked it to try to guide it out of the harbor. "It was heartbreaking. I mean, to see an animal like that - in distress - and not being able to really do anything meaningful. All the stuff that we were trying was exactly that, just trying the best that we could to respect the animal and not try to further agitate it," said John Higgins, a harbor master for the Ventura Port District. The search was suspended in the late evening, but when rescue crews returned to resume operations Sunday morning and found no signs of the whale, Ventura Harbor Patrol officials later confirmed it made its way out. The device used to play whale sounds was left near the harbor entrance overnight, hoping that it might help lure the whale out, and it's believed it may have assisted in the whale's successful departure.